Particularity: The descent of the Ardèche in canoe kayak provides multiple aspects. Thus picturesque villages (Vogue-Balazuc…) are followed closely by the majestic Pont d’Arc and the entrance of the Gorges de l’Ardèche. 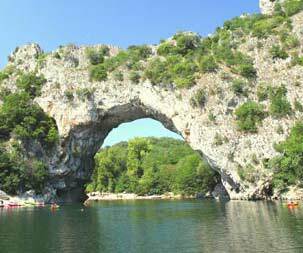 A remarkable site both for the quality of its landscapes, the variety and richness of its natural heritage sites, historic and prehistoric (the grotto of Chauvet), the Gorges de l’Ardèche offer opportunities of discovery, escape, and nature activities. The amazing biodiversity that composes the wildlife as well as vegetation is another sign of its richness. From a technical angle, the Ardèche is a rank 2 river. The river, with its emerald coat flows lazily in the summertime, and can become unpredictable in the fall under heavy rain (Cevennes episodes) but that is part of its charm and uniqueness. Thus depending on the water level the descent will vary; more aggressive in the springtime, it becomes both smoother and calmer in the summer and provides unique senses at each season.